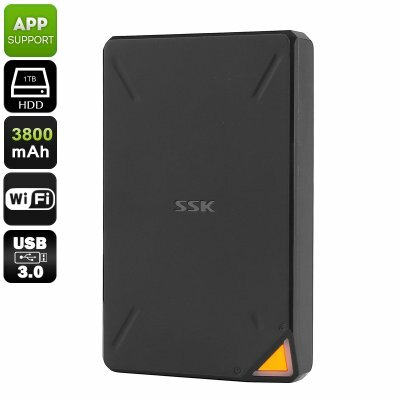 Successfully Added Portable WiFi Hard Disk - 1TB Storage, 300Mbps Transmission, 3800mAh Battery, App Support, Remote Access, USB 3.0 to your Shopping Cart. This 1TB hard disk allows you to store all your files and carry them along wherever you go. It features a compact and lightweight design which makes it very portable. However, what sets this smart hard drive really apart is its WiFi connectivity. Thanks to this, your WiFi hard disk allows you to open all your files remotely. It does not matter whether you’re using your phone, tablet, or laptop. With this 1TB hard drive at your disposal, you’ll always have access to your personal files. With its double encryption, it offers high protection against unwanted intruders. You’ll be able to securely store your private documents without needing to worry about anybody else accessing them. With transmission speed of 300Mbps, this Wifi hard drive allows you to access your documents in the blink of an eye. It furthermore supports a USB 3.0 input which supports fast transmission speeds that bring along high usability. This smart WiFi hard drive can be used with Windows, Linux, and MAC. Additionally, you’ll be able to access remotely on your iOS or Android phone via the dedicated application. Its remote management allows you to open up your work documents at home or personal video’s and games while traveling abroad. This 2.5-Inch hard drive supports a multi-people sharing feature. Through this, up to 10 people are capable of accessing your 1TB hard drive at once. Thanks to this feature, your storage device is highly efficient for the usage in small companies. You and all your colleagues will be able to store all work related documents and open them anywhere on the globe. This smart backup device comes with a powerful 3800mAh battery that allows you to use it on the go. No matter where you’ll be heading next, from now on you’ll always have your documents and media at hand. This portable hard drive comes with a 12 months warranty, brought to you by the leader in electronic devices as well as wholesale electronic gadgets..